Sprinkle a clean, flat surface with coconut flour and roll the dough out until it is 1/4 thick. I like laying it on a piece for parchment paper and placing another sheet on top to roll it out. Or you may have to rub the rolling pin with coconut flour to do this. Cut out the cookies using your choice of cutters. Work somewhat quickly so the dough stays cold. Using a spatula, transfer the cut cookies to the baking sheets. Gather the remaining scraps back up into a ball and roll out again. Repeat rolling and cutting out cookies until you use all the dough. If the dough gets too warm while you work with it you may need to chill it again. Bake the cookies for 13-15 minutes, until lightly golden. 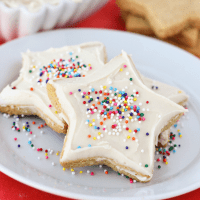 These cookies need to bake longer than typical sugar cookies. They will stay soft and just get a little crispy, which is just what you want! Cool on a baking sheet for 2 minutes then transfer to a wire rack. Cool completely before frosting. Enjoy! I’ve consistently gotten the best results with these cookies using 3/4 cup white sugar (I use evaporated cane juice). You can substitute 3/4 cup coconut sugar, but the dough will be slightly softer. Update 11/15 – I highly recommend using Honeyville or Digestive Wellness blanched almond flour for this recipe. While I love Bob’s Red Mill for other flours, their almond flour is grainy and doesn’t work as well here. To make sure these cookies turn out, scoop and almost pack the almond flour down when measuring it. Additionally when rolling and cutting the dough, work quickly so the dough stays cold. I like rolling it out in-between sheets of parchment paper dusted with coconut flour.If you have trouble cutting them out, try rolling out the dough then placing it in the freezer for 10 minutes before cutting the shapes out.